A Buddhist approach to navigating key relationships with lessons from the cult classic film. In this accessible and often inspiring new book, Buddhist studies teacher and author Nichtern (The Road Home: A Contemporary Exploration of the Buddhist Path, 2015, etc.) applies a contemporary understanding of Buddhist practices to the core foundations of friendships, romantic attractions, and family bonds, relaying how and why meaningful companionship can be essential when undertaking a path toward spiritual self-discovery. The author draws expansively from his own experiences with relationships and as a teacher of meditation and Buddhism, but he also attaches relevance to the evolving relationships explored in The Princess Bride. “The ‘dharma’ contained in The Princess Bride is all about relationships,” writes Nichtern. 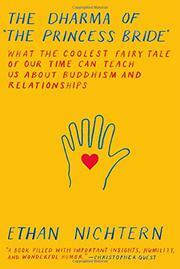 “The story offers a perfect canvas upon which to explore the three things that almost always take over the discussion when I teach Buddhism: the dharma of friendship, the dharma of romance, and the dharma of family.” In the first section, “The Dharma of Friendship,” he uses the film’s narrative arc and character development to convincingly illustrate how and why friendships form. In later sections, which deal with romantic attractions and family bonds, the author effectively engages readers with his ability to streamline complex Buddhist concepts and accessibly share authentic personal experiences. The author clearly has a deep affection for The Princess Bride and its characters, which provides a convenient platform for many of the concepts. Yet even for readers who may be unfamiliar with the film or are not die-hard fans compelled to rewatch multiple times, the strength of Nichtern’s Buddhist insights and overall content extend well beyond the film’s connection. A generous and instructive book on working through relationships, with much to recommend for readers, whether they are fans of The Princess Bride or not.